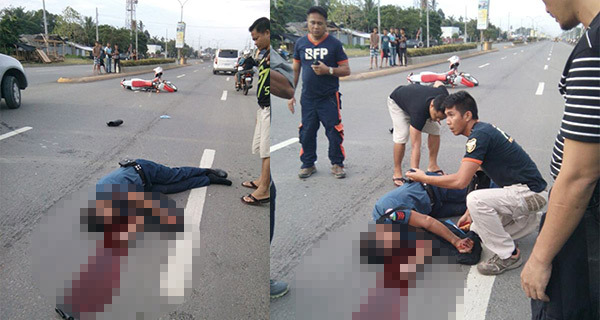 A tragic road accident occured Wednesday afternoon in Panabo City, Davao del Norte when a motorcyle driven by a traffic cop hit a truck. 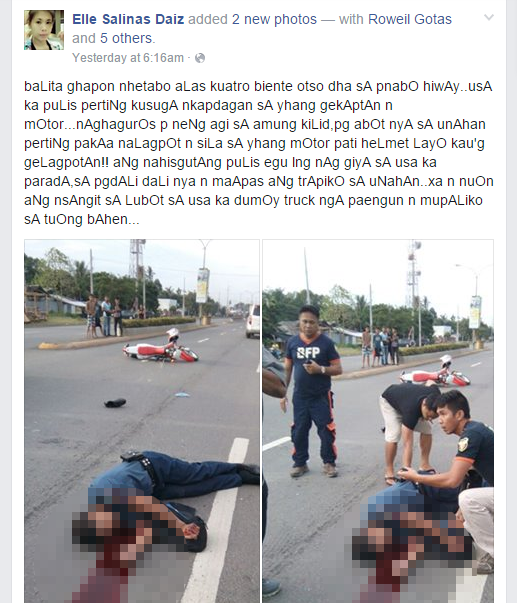 According to netizen Elle Salinas Daiz, who uploaded two photos showing the bloodied victim lying on the concrete pavement of the road, the accident took place at around 4:20 p.m. on August 19. Written in vernacular, the report said the traffic police officer was guiding a parade when the mishap happened. Apparently, he was speeding to clear the road of vehicles ahead of the marching group, but hit the back portion of a water delivery truck going to the right lane. The victim's body reportedly got thrown up in the air and landed several feet away from his helmet and motorcycle. Another reporter stated that the traffic officer was still alive when the photos were taken. He was later declared dead on arrival at the hospital, the source added. As of yet, both reports have not been independently verified.